The Sunny SF-B1421 is an indoor cycling bike model released in 2015, but still is one of their highly rated exercise bikes to this day, due to its sturdy construction and excellent price / value ratio. It’s an affordable bike, slightly smaller than other models, such as the SF-B1110 or SF-B1002, evidently a great choice for anyone without too much storage space to spare. And on top of that, it comes with a fitness meter unit, accessory which many other exercise bikes don’t include. 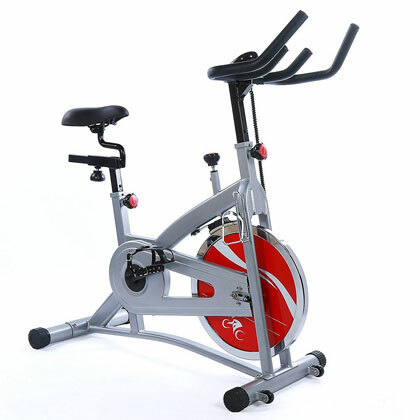 The Sunny Health & Fitness SF-B1421 exercise bike features a steel frame, coated with corrosion resistant paint, in gray color, this being the only color available for this model so far. Its handlebar and seat posts are painted black though, while the flywheel has a chrome finish. Even though it’s a lighter bike, weighing only 77 lbs (35 kg) and having a weight capacity of 265 lbs (120.2 kg), it does have a frame construction designed for spin workouts. Also, its crank system is solid enough to support just about any spin workout. Although it has a rather small footprint, taking only 40″L x 20.3″W (101.6 x 51.5 cm) of floor space, it’s still a stable bike. It shouldn’t rock or move, even if you engage in a more demanding spin workout. Its rear base tube features adjustable (rotating) PVC caps, providing the possibility to stabilize the bike even on uneven floors. But it doesn’t have rubberized foot stabilizers, such as the Exerpeutic LX905 for example, it’s best to place this bike on a rubberized mat, for extra stability and grip onto the floor, and to prevent any damage to the floors. As we’ve mentioned above, this Sunny exercise bike isn’t extremely heavy, weighing only 77 lbs (35 kg). However, its front base tube integrates a set of transport wheels, which facilitate its relocation. By leaning it forward on its wheels, you will actually be handling less than 50% of its total weight. The seat supplied with this Sunny indoor cycling bike is not a slim seat like the ones that come with most spin bikes. It’s a bit wider, offering a little bit more comfort. It features a standard connection system to its post, thus in case you’re not happy with it, you should easily find a replacement for it, to fit on this particular bike. Also, its comfort can be considerably increased with a sheepskin cover or gel cover. The seat is 4-way adjustable (up, down, forward and backward). It has several adjustment positions, being able to accommodate users between 5’0″ – 6’3″ (152 – 190 cm). If you’re taller, you should still be able to use this bike. But in this case you won’t benefit from a complete leg extension, which may diminish the effect of your workouts. The bike is equipped with a 2-way adjustable (up, down), multi-grip handlebar, which also integrates a set of aerobars. The handlebar assembly is almost fully covered by a sheet of rubber-foam material, to provide a comfortable grip. 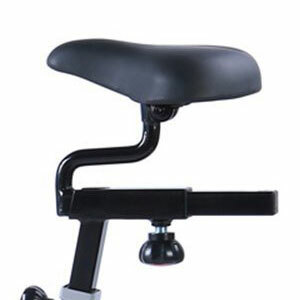 Both seat and handlebar feature large adjustment knobs, which are easy to grip, pull and turn. Therefore, adjusting the bike for your own requirements takes less than a minute. Last but not least, the bike doesn’t come with a reading rack or tablet holder. However, you can place and secure one on its aerobars, behind the meter unit. The Sunny SF-B1421 features a very smooth and quiet chain drive system, which generates a pedaling feel similar to a road bike. The chain comes pre-lubricated with industrial grade lubricant, thus it shouldn’t require any lubrication at least for a while. Even though it’s a rather light indoor cycling bike, its flywheel weighs 30 lbs (13.6 kg), also being perimeter-weighted, which means it provides a consistent momentum, and a smooth, steady pedaling motion. This exercise bike allows reverse pedaling, which is a plus, as you can diversify your workouts. But when pedaling in reverse, the tension applied onto the flywheel by the resistance pad is still present. Thus, reverse pedaling can also provide a decent workout. Coasting is not possible, as the transmission is simple, and does not integrate a derailleur or anything similar to a road bike. Also, when pedaling in reverse, the fitness meter unit will continue to track your workout statistics. As we’ve mentioned above, this exercise bike is capable of supporting almost any spin workout. Its crankset features solid steel crank arms, being sturdy enough to support the user in complete stand-up pedaling routines. The pedals supplied are made of metallic alloy, and are equipped with toe cages for extra foot support and thrust during pedaling. They don’t integrate clips for spin shoes, however their threads are standard and you can replace them with SPD pedals if you want. 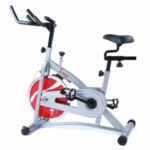 This Sunny indoor cycle trainer is equipped with a standard top-to-down felt-pad brake system. In other words, you don’t have to connect it to a power source in order to benefit from resistance. The brake pad is connected to the resistance knob on top of the main tube of the bike. There are no tension levels specified on the knob though. To increase resistance, you simply tighten the knob as you pedal, until you find the most suitable tension. The resistance adjustment knob doubles as an emergency brake. In case you need to stop the flywheel (and the pedals) from spinning, you simply need to push the knob down. The resistance pad can be tightened onto the flywheel up to the point you can barely pedal. In other words, this bike gives you the possibility to simulate a really steep climb workout. 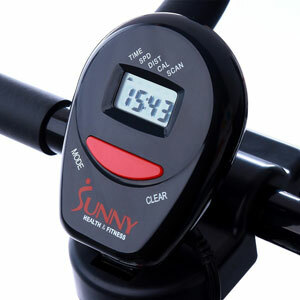 The fitness meter unit supplied with this Sunny exercise bike is the same as the one for the SF-B1423 model. It’s a basic meter, which can track your speed, distance traveled, time elapsed and calories burned. You can select any of these values to be displayed on screen at all time, or you can use the unit’s SCAN function, which rotates the values displaying each one on screen for several seconds. The meter unit is easy to operate. It features only one button with two press functions: MODE (left) and CLEAR (right). MODE is used to scroll and select a certain value to be displayed on screen, or the SCAN function. Clear covers the unit’s reset function. By pressing clear, all its values are reset to zero. The flywheel, crankset, chain and resistance pad come already attached to the frame, however there’s still some assembly to be done. You will have to attach the frame to its bases, add the seat and handlebar, pedals, and the fitness meter. The hex keys required for assembly are supplied, and the box also includes a manual that provides clear step-by-step instructions. The whole assembly part shouldn’t take more than 30-40 min. As we’ve mentioned above, this bike uses a chain drive system similar to a road bike. 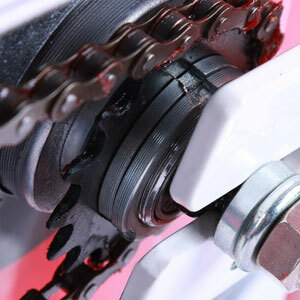 Therefore, its chain may require lubrication after a while. The brake pad will wear after one or two years of use, depending how often you use the bike, and will require replacement. Also, in case the felt pad squeaks or emits a burning smell when in contact with the spinning flywheel, adding a bit of silicone lubricant on the flywheel should solve the problem. Not a very comfortable seat, but it can be replaced or padded with a sheepskin or gel cover. 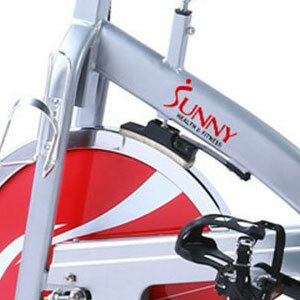 The Sunny Health & Fitness SF-B1421 is an exercise bike designed for spin workouts, for users up to 265 lbs. It has a small footprint, great for small apartments or rooms. It features a sturdy construction, great adjustability, and also includes a fitness meter unit. It’s an excellent fitness bike for cardio workouts, for toning muscles, regaining or maintaining stamina, and of course, for losing weight. You can actually burn up to 5-600 calories per hour on this bike, depending on the workouts used. And finally, since it costs less than $200, while other less inclusive models cost more, we can safely say that it offers excellent value for the price.